I decided this weekend to take some time off from paid work and do some activities that I would enjoy just for myself. I did get slightly distracted yesterday and spent rather a long time on the phone arranging a trip away (which will be great when it happens, but required quite a bit of organisation) and writing a piece of text for the Permaculture Association, but today has more or less been just about me… a lie in with an audiobook, a walk on the beach with the dogs and my sweetie in the sunshine (yes, sunshine in west Wales in November), tea and cake when we got home and then an afternoon of felting. Making felt is an activity that I had been interested in doing for ages, but it wasn’t until two years ago that an opportunity finally presented itself to go and learn how. I know that I could have bought a book and just got on with it, but wet felting is such a tactile activity that I really wanted to learn from a real person. And the autumn before last the wonderful Lorraine Pocklington of Greenweeds ran a beginners felt-making workshop at Denmark Farm. And from that moment on I was hooked. I started off, at the workshop, making a case for a passport… a simple thing, but it introduced me to the idea of being able to create three-dimensional objects without the need for seams. I knew that this was possible in knitting, through the use of double-pointed needles, but the fact that felt can be thick enough to hold its own shape and can be sculpted opens up a whole range of possibilities. Last year I went on another course to learn to make felt hats and last month, another for felt slippers, both again at Denmark Farm, which is less than 15 miles away from home. 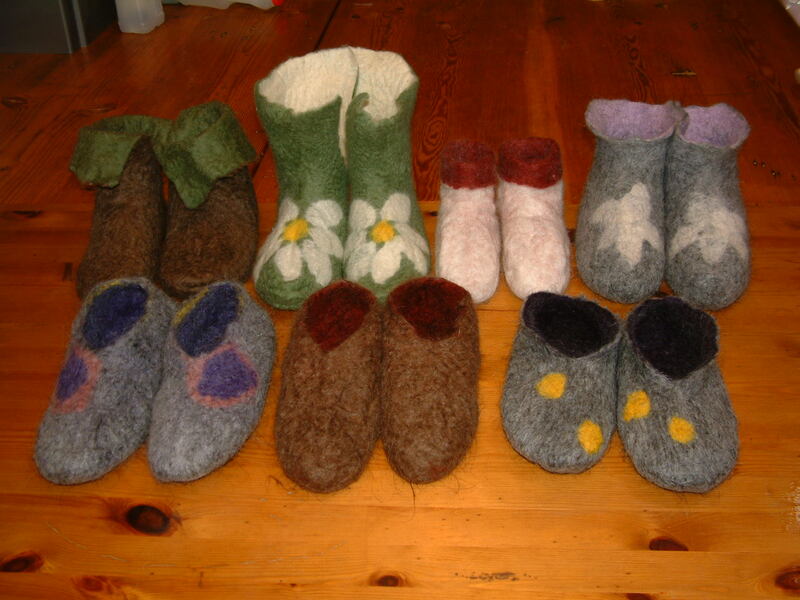 The slippers are not yet finished as I want to decorate them with some needle felting and I haven’t got round to it … I just need more hours in the day, or fewer projects on the go! 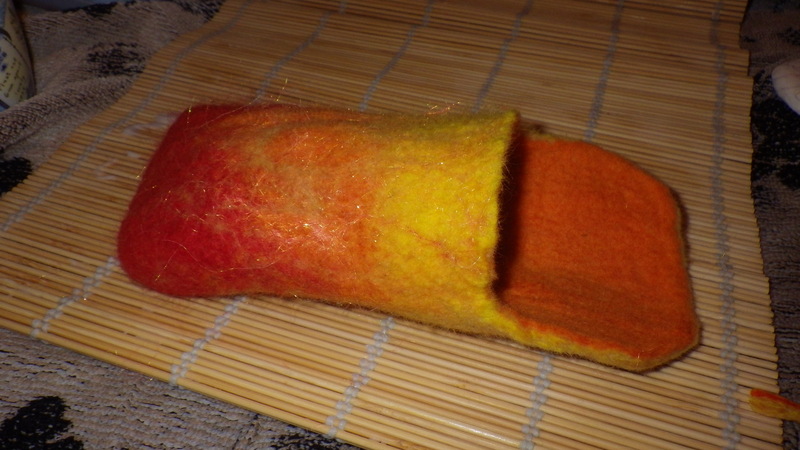 Next spring it looks like there will be a course on nuno felting (that’s where you felt onto fine fabric)… I can’t wait. However, this afternoon’s project was to make a case for my new digital camera. Because felt can be thick, it can be used to make covers for electronic equipment to provide protection. 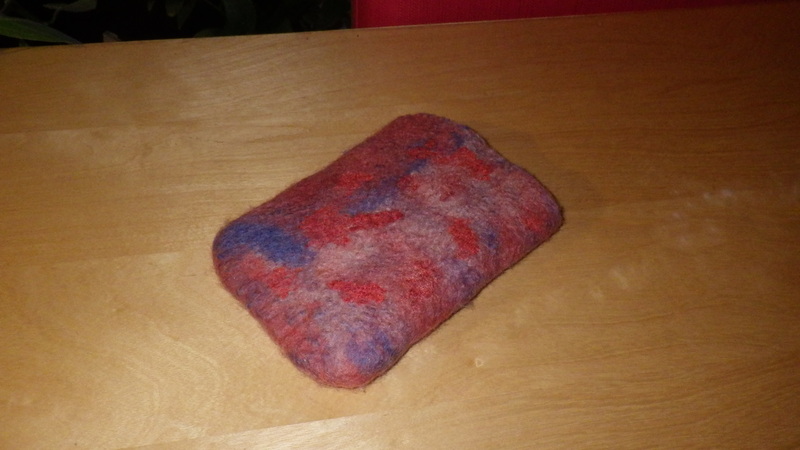 A couple of months ago I made a case for Mr Snail-of-happiness’ new tablet computer. This did not come out quite as I had intended because I was using a new fibre that shrank more than I expected, but it is still serviceable. 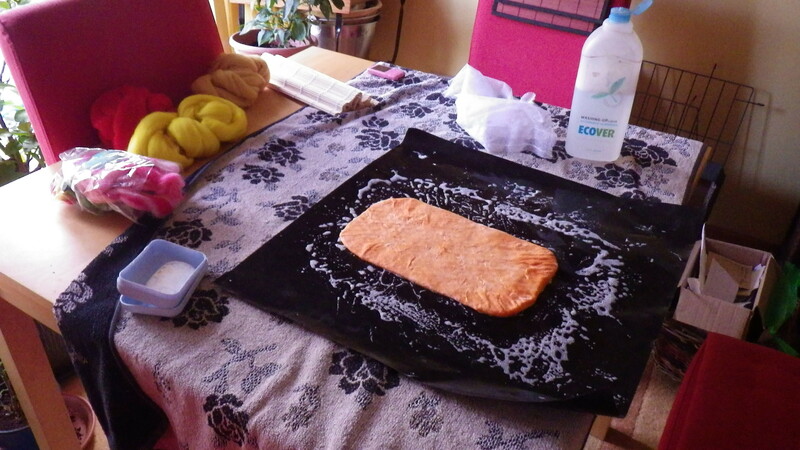 Today, however, I used I wool that I have worked with before and the properties of which I know reasonably well. I wanted to experiment with a sort of flame effect with the colours, and I’m quite please with the result. It’s drying now and I will finish it off with a couple of buttons to close it and possibly a wrist strap.